Joanna Thompson speaks Friday at an ASG-sponsored event in Harris Hall. Thompson talked about stigmatization and violence in LGBTQ relationships. 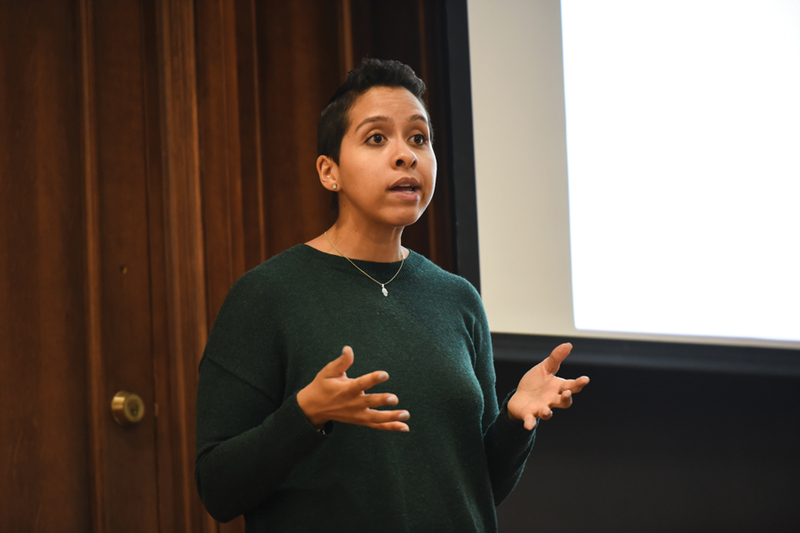 As part of Associated Student Government’s first Wellness Week, Joanna Thompson spoke Friday about healthy relationships in LGBTQ communities. Though similar to heterosexual relationships in many ways, relationships within the LGBTQ community — and even within “each letter” — face a unique set of challenges, she said. Thompson is the community outreach and engagement coordinator for the Anti-Violence Project at the Center on Halsted, the “most comprehensive” LGBTQ community center in the Midwest, according to its website. Thompson began by defining terms important to the LGBTQ community, such as sexual orientation and gender identity, which she said are not the same or interchangeable. The speaker also said sexual orientation and gender identity exist on spectrums, and that it is important to never put people into “boxes” and assume identities based on stereotypes and biases. Thompson said LGBTQ people are often forced to rely on friends and “chosen families” for support after their biological families abandon them. This can make coming out an especially isolating and scary experience, she said, adding that telling an entire audience she is queer is still “a little difficult” for her. Society is still pushing individuals to conform to heteronormativity, Thompson said, making the LGBTQ community even more vulnerable to violence and further stigmatization. Because circumstances have discouraged LGBTQ individuals from being open about their relationships in the past, Thompson said there are not as many visible examples of healthy LGBTQ relationships from older adults. “We want individuals to feel that they can navigate the world and be their true and whole selves all day, every day,” Thompson said. In a later discussion of domestic and sexual violence, Thompson said the stereotype that men always perpetrate abuse in heterosexual relationships leads people to assume there is “mutual abuse” in abusive queer relationships. But, she said this “myth” about mutual abuse leads people to dismiss domestic and sexual violence in queer relationships. Wellness Week’s project head Alexis Bullock said people often fail to understand that in queer relationships, there is still a person in power even though the gender dynamics are different. “The violence is normalized, and that’s not okay,” the Weinberg sophomore told The Daily.